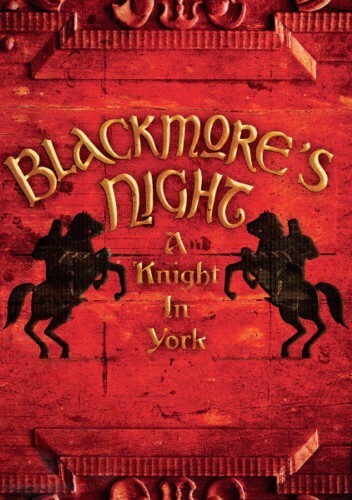 I remember the joy of only having to travel for an hour to attend this gig - Blackmore's Night hadn't been to England for quite some time, a fact Candice illustrated when she announced that there had been two albums and the arrival of their daughter Autumn since we last saw them! The performance the band gave that night, in the beautiful setting of York, was absolutely phenomenal, clocking in at a good two and a half hours, and I came home having thoroughly enjoyed it. I was also aware the show had been recorded so I have looked forward to its release for some time. The band concentrate the setlist on the most recent material, giving the chance to hear songs from 'Secret Voyage' and ‘Autumn Sky’ live. 'Locked Within The Crystal Ball' is an inspired choice as the concert opener, with its cheerful upbeat feel and superb lighting. The stage is decorated as a forest with a projection screen backdrop which changes accordingly, offering an authentic feel to the majesty of the music. Other tracks from 'Secret Voyage' include 'Gilded Cage', 'The Peasant's Promise' and 'Toast To Tomorrow', while the newest material comes in the form of 'Darkness', 'All The Fun Of The Fayre' and 'Dance Of The Darkness'. Ritchie Blackmore plays superbly as expected and indulges in some light hearted banter with Candice throughout. Candice herself is on exceptional form - she has grown into a confident and striking front woman, with a natural charm and humour when addressing the audience. Her vocals range from ethereal to soaring, one of the highlights for me being her heartfelt version of 'Barbara Allen'. Other stand out moments include Ritchie bringing out the legendary Stratocaster for some truly superb playing in 'The Circle' and an amusing cameo appearance from the afore-mentioned Autumn… not to mention Lady Gaga - just watch it, you'll see what I mean! Naturally there are some of the older favourites as well, such as the brilliant 'Fires At Midnight', nestled along with the unexpected, such as a spontaneous cover of the Bee Gee's 'First Of May'. The long show I attended has been edited down into a fourteen song, ninety minute concert, with songs that have already been featured on previous DVD's making way for the newer stuff to avoid duplication. Extras are in short supply here, with just some footage of York to look at while the band's music plays in the background, but you have an in depth interview with Ritchie and Candice right here in these pages, so what more do you want? Even with so many great tracks omitted from the show they recorded, it's still a superb concert, highlighting the quality of the songs at their disposal. If, as Candice suggested, some of the stuff on the cutting room floor may be packaged together for an anniversary, then even better. Excellent stuff!